Abyei town may not look like much - a few low brick buildings scattered amongst thatched huts and dusty tracks - but this normally sleepy place is raising fears of a new Sudanese war after northern forces seized control over the weekend. The region is often described as "oil-rich", but after the 2009 Permanent Court of Arbitration ruling in The Hague, most of the oil fields now fall outside Abyei's borders. It does still produce oil, but the real issue here is more ethnic than economic. 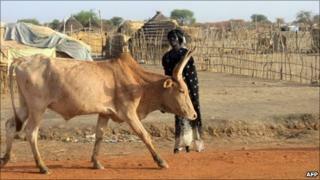 Abyei is claimed by a southern group, the Dinka Ngok, and northern nomads, the Misseriya. The Misseriya spend part of each year grazing their cows in the area as part of a great trek into greener pastures which takes them deep into South Sudan, which is due to formally become independent from the north in July following decades of conflict. There are several prominent Dinka Ngok in both the Sudan People's Liberation Army, which fought for the south's independence, and in the SPLM, its political wing. Armed groups of Misseriya were often used as a proxy army by Khartoum during the civil war. The north fears alienating the Misseriya, who also live in the combustible neighbouring state of Southern Kordofan. So both Khartoum and Juba have strong reasons to care about a seemingly insignificant patch of land. Tensions in Abyei grew once a referendum scheduled for January on whether to join the north or the south did not take place. There was no agreement on whether the nomadic Misseriya were eligible to vote. A string of clashes followed, but this latest incident, involving direct confrontation between the northern and southern armed forces, is by far the most serious. Shall we now sacrifice peace for which we paid so dearly for a limited piece of land in which both sides have undeniable rights? Following what they described as a "southern ambush" on their men on Thursday, the northern army seized control of Abyei town, the capital of a disputed border region, on Saturday. To drive the point home about who is now in charge, President Omar al-Bashir issued a decree dissolving Abyei's joint administration, which was headed by a southerner. The US and the UN condemned what they essentially characterised as a southern provocation followed by a northern over-reaction. The UN Security Council made it clear these events would not affect southern independence on 9 July. But nobody can say for sure whether it will be a peaceful divorce. The most likely is that the north will keep control of Abyei. They would start from a very strong position in the negotiations about the region's future, which would please the Misseriya. However the south might be able to score some negotiating points since Abyei was taken by force. A second possibility is that the northern troops will withdraw after some time. The UN Security Council said a northern official, Amin Hassan Omar, made this commitment to it. If this is the case, the northern armed forces will have shown their superiority, not least in terms of equipment, over the south. The northern army rolled into Abyei with numerous tanks, following aerial bombardments and shelling, easily dispersing a numerically inferior opposition. This reinforced the prevailing wisdom in Sudan that the southern armed forces do not have the technology or training to fight a conventional battle with the north. That is perhaps a useful message for the north to hammer home, in the light of the charged negotiations taking place on Abyei, as well as on other issues like economic resources, and in particular oil. The last possibility is a return to all-out conflict. US Senator John Kerry, who has visited Sudan several times, describes the country as "ominously close to the precipice of war". This could be triggered by a southern military response to the northern takeover of Abyei, or further northern moves. But the initial southern public statements have been cautious, calling on the UN to get Khartoum out of Abyei, rather than threatening to counter-attack. The southern army is stretched, as it has to deal with several rebellions, including in Unity State just over the border from Abyei. The south firmly believes Khartoum is funding the rebellions, a charge the northern authorities have always denied. Campaigner John Prendergast of the US-based Enough Project sees domestic political reasons why Khartoum might want to fight. He says the influential former head of National Security, Nafie Ali Nafie, has won an internal struggle for control of President Bashir's National Congress Party's direction. "Nafie is escalating in Darfur, Abyei, and throughout the south, seeking to address Khartoum's political problems with military force," he told the BBC. "If the Security Council fails to grapple with this trend, we will see full-scale national war in Sudan by the time the south becomes an independent state on July 9th." Influential Sudanese journalist Mahjoub Mohamed Salih goes further. "What is now taking place [in Abyei] is by all standards a war between two countries," he wrote. He believes the solution is to give the region a special status under President Bashir and Southern President Salva Kiir, and remove all armed elements from it other than UN peacekeepers. The African Union mediation lead by former South African President Thabo Mbeki will undoubtedly have its own ideas on how to end the crisis too. The US has already explicitly linked progress on Abyei to removing Sudan from the list of countries it believes sponsors terrorism. But northern politicians believe the US has gone back on several promises to improve its relationship with Khartoum in the last few years, weakening US leverage. Whatever happens next in Abyei and in north and South Sudan, there is no doubt the clash between the two armed forces has brought the spectre of a devastating new war considerably closer. Journalist Mahjoub Mohamed Salih asks the question on everyone's mind. "Shall we now sacrifice peace for which we paid so dearly for a limited piece of land in which both sides have undeniable rights?"